Handheld DO meter for field measurements. Useable anywhere, the WTW Oxi 3150i and Oxi 3300i handheld dissolved oxygen meters are robust, easy to operate and provide assured accurate readings. In combination with galvanic oxygen meter probes DurOx® 325 or CellOx® 325 (no polarization time required) the handheld dissolved oxygen meters are ready for immediate use anywhere, especially in fish farming applications. This easy to use handheld dissolved oxygen meter will meet all your day-to-day demands. This simple, robust dissolved oxygen handheld meter has a simplified keypad, with no memory function and no manual input facilities. When used in combination with the DurOx® 325 dissolved oxygen meter probe and its protective hood the handheld DO meter is particularly suitable for measurements in fish-farming applications. The compact precision handheld dissolved oxygen meter Oxi 3300i enables you to carry out oxygen (DO) measurements rapidly and reliably. The Oxi3300i handheld dissolved oxygen meters provide the maximum degree of operating comfort, reliability and measuring certainty for all applications. Loaded with additional features, the Oxi 3300i handheld DO meters include automatic temperature and air pressure compensation, salinity correction, GLP-supporting functions and built in datalogger. The handheld dissolved oxygen meters also have auto ranging and auto read function, which checks the stability of the input signal, for ease of use and data reproducibility. Some oxygen is dissolved in practically every liquid. For example, at a temperature of 68 °F (20 °C) and an atmospheric pressure of 1013 mbar saturated water contains about 9 mg/l oxygen. Ethanol can contain up to 40 mg/l whereas glycerol only has about 2 mg/l. Each liquid takes up oxygen until the partial pressure of oxygen in the liquid is in equilibrium with the air or gas phase in contact with it. The actual oxygen concentration depends on a number of factors, such as temperature, air pressure, oxygen consumption by microorganisms in a biodegradation process or oxygen production by algae, etc. Shelf life of beverages, etc. The determination of the dissolved oxygen concentration was formerly carried out by the WINKLER titration method. Today electrochemical measurement is a recognized method in numerous standard procedures. In its simplest form a dissolved oxygen sensor contains a working electrode and a counterelectrode. Both electrodes are located in an electrolyte system which is separated from the sample by a gas-permeable membrane. The working electrode reduces the oxygen molecules to hydroxide ions. In this electrochemical reaction a current flows from the counterelectrode to the working electrode. The more dissolved oxygen present in the sample, the larger the current signal. The handheld dissolved oxygen meter calculates the oxygen concentration in the sample from this signal. 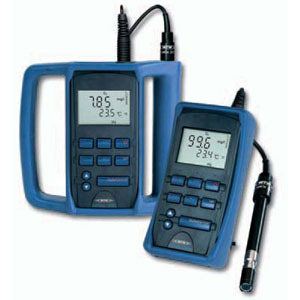 Includes dissolved oxygen meter, DurOx® 325-3 dissolved oxygen probe (9.8ft cable), case & accessories. Includes dissolved oxygen meter, CellOx® 325 dissolved oxygen probe (5ft cable), case & accessories. Includes 5 ft (1.5m) cable. Other cable lengths available, call for pricing. Includes 9.8 ft (3m) cable. Includes DO electrode, protective sensor cap, spare membrane cap, electrolyte, four 1.5V SR44W batteries, and a 48" (1.2m) neckstrap. Measure 6 water quality parameters.